Walking around Florence you will find over 1,200 tabernacles – there is one on almost every street in the city. In the past, if Florence underwent a siege or a plague, Florentines could pray to the tabernacle of Saint Augustine, sometimes without even having to leave the comfort of their home. In 1845, a traveler commented how if steps were not taken to restore this particular tabernacle, it will fall off the list of historic monuments in Florence due to its degraded condition. Recently, the tabernacle of Saint Augustine has been restored by Friends of Florence and can be found behind Santo Spirito. 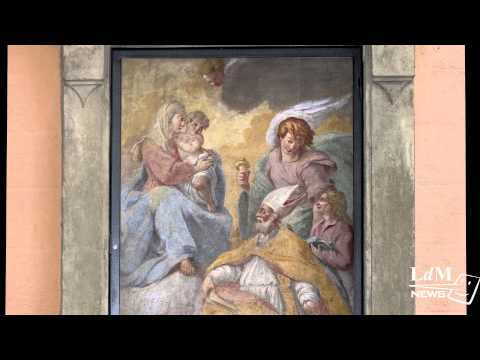 The work was by a Florence artist, Niccolo Manetti, who had also done some of the frescoes in the nearby Santo Spirito Church. The restoration has brought the tabernacle back to life: its colors are vibrant and the detail is more beautiful than ever.